In 2010, state lawmakers in Arizona passed legislation that banned courses that “promote resentment toward a race or class of people.” But the legislation was, in reality, specifically targeting a Mexican American Studies program that started decades ago after Black and Latino students filed a desegregation lawsuit. While Tucson initially kept the Mexican American Studies program, the school board caved in 2012 and ended it after threats that they would lose a significant portion of their state funding. 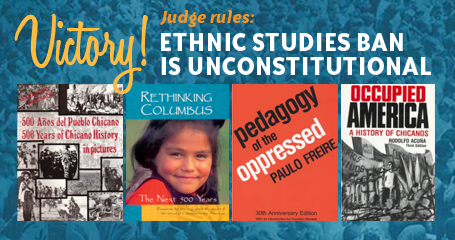 Part of ending the program meant banning the Rethinking Schools book, Rethinking Columbus, from classrooms along with Paulo Freire’s Pedagogy of the Oppressed, Rodolfo Acuña’s Occupied America, and 500 Años del Pueblo Chicano/500 Years of Chicano History in Pictures by Elizabeth Martínez. In some instances, school authorities shocked students and confiscated the books during class. After several legal challenges, a federal judge last week ruled that the state of Arizona violated the constitutional rights of students by eliminating the program, and further went on to say that those who targeted it were motivated by racism and political opportunism. Ari Bloomekatz talked with Dr. Curtis Acosta about the ruling for the Rethinking Schools blog. Acosta taught for 20 years in Tucson with the Mexican American Studies program, was a plaintiff in some of the initial legal challenges to the ban, and was an integral part of the challenge that eventually prevailed. This interview has been edited for clarity and length. ARI BLOOMEKATZ: Were you surprised by the verdict? CURTIS ACOSTA: Shocked is better than surprised. At the end of closing arguments, Judge A. Wallace Tashima made it pretty clear — he said it was going to take him a couple weeks and it took him a little bit longer than that. And so we knew it could be any day, and I wasn’t surprised when it finally came, but we were definitely shocked with the intensity, and the care, and the totality of the victory. Judge Tashima’s legal analysis was just exhaustive in how he connected all of the actions, both in the production and construction of the law as being highly motivated by racial animus, to the application, to the enforcement. It was amazing, so that’s the reason the word shocked comes to mind. Just an incredible moment in history and an incredible punctuation to a long journey. Continue reading at Rethinking Schools.